We had the most glorious weather over the 3 days and all of our pups from 3 different age groups were on show each day. The E litter are pictured here on the final day with Ella and the Police dog display team. 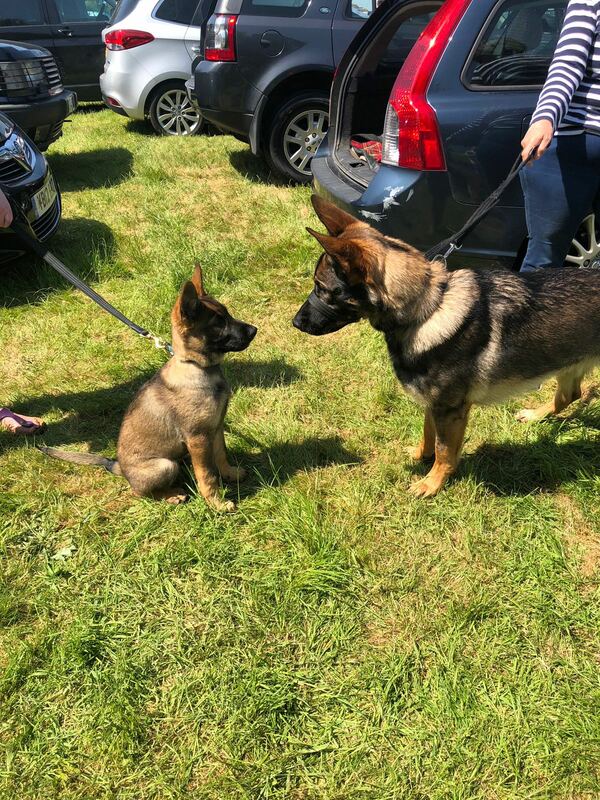 It’s great that the public get to see the pups and it gives me an opportunity to see how they all cope with the crowds, other dogs, different noises, the funfair, livestock and a whole range of different situations. It certainly gives me a valuable insight into whether they have the necessary confidence to be future Police dogs. On Thursday our puppy walkers and pups were Terry and Jill with 7 month old Henry, Lyn and John Parlour with 9 month old Merlin and Colin and Mitzi with 10 month old Quest. There were 2 displays from the Operational dog teams, one in the morning and one in the afternoon. As a warm up prior to each display the pups went on and did a short display on the ramps and tunnel before meeting the crowd. Here they are just before going on. Here is Mitzi and Quest going over the ramps. Here is Henry doing the tunnel with Jill. Here is Merlin confidently striding into the arena with Lyn. All of the pups then did a lap of the arena to meet the crowd. I then did a short demonstration of the qualities required of a potential breeding female with Ella. Here she is getting her reward having just searched and located a 2 pence piece hidden in the grass to demonstrate her nose work ability. The main display then took place with the operational dog teams. 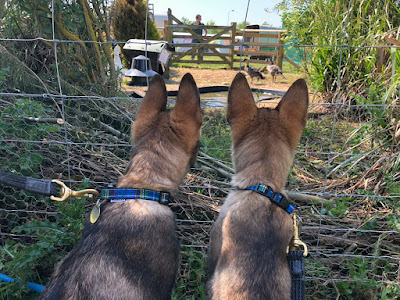 Throughout the rest of the day we took the pups around as many different areas of the site that we could but always mindful of giving them lots of rest, access to water and keeping them in the shade. Merlin pictured here on the right was initially a little unsure of one of the mascots but he quickly recovered. Recovery is always what you look for in a potential Police dog. All young dogs will meet new situations that they are unsure about but as long as they don’t show an extreme reaction and recover then that is all you can ask for. The 3 dogs were very confident on everything we encountered which included the dodgems, the waltzer, and they were all very sensible meeting other dogs. Here are some more photos of their day. I was extremely impressed with the teams and before we knew it was time to go and 3 very tired dogs certainly would have slept well that night. Friday was our middle group who are all between 5 and 6 months and will be on our January 2019 Initial Police dog course. From left to right are Lola, Larry, Star, Sydney, Ben and Bill. Once again the handlers and pups were exceptional throughout the day. The pups were very confident with everything they encountered and I was very impressed with how well behaved they were meeting other dogs. Star one of our Dutch imports does have an issue of being approached by certain men. You can just see here that he is unhappy with the Ride attendant above him. To be fair to Star that only occurred on a couple of occasions and the rest of the time he was fine. He does have a few issues as can be seen here when we assessed the dogs going onto different floor surfaces. He is currently staying with me while Margaret his puppy walker is on holiday. I was convinced that his nervousness probably ruled him out as a future Police dog. But having had him at home for 5 days the improvements I am seeing are making me think my initial assessment may have been a little premature. Regardless of whether he will make a Police dog or not I will use the time I have with him to help him to become a more confident dog. I will be doing a separate article on Star and also on Gunnar who I am working with re food aggression in my next blog. Gunnar was with me at the show and did very well. We all had an excellent time and thoroughly enjoyed the day together. Here are some photos of our day. Saturday was the turn of our youngest group the E litter. Pictured left to right are Ernie, Errol, Eyke, Echo and Eddie. We had only had one training meeting on the previous Sunday to prepare but I was confident they had the strength of character to cope. We met at HQ before setting off to the show. I had selected the young group for the final day because the operational dog teams only perform one display on the final day and this made it a short day for these young growing pups. He we all are after arriving heading off to the Police tent to meet the public before our display later in the morning. It was an extremely hot morning and so we only did a 15 minute meet and greet at the Police tent. We then returned to our shady base to keep cool and to continue meeting the public out of the heat. Then it was time to make our way to the Arena for our small display before the main Operational team display. We waited in the shade for our turn. Then it was into the arena to introduce the pups to the crowd before they gave a display on the ramps and the tunnel. After their display the pups were feeling the pace and so with some long journeys ahead of them most of the puppy walkers made their way home after a fantastic day. Here are a few more photos of the pups. Ernie being carried to the car for the journey home. Errol and Ernie enjoying watching the ducks. Eddie letting a very tolerant Quest know he is not overawed by him. Echo and the boys hanging around for an ice cream. I would like to thank all of my puppy walkers for bringing their pups to the show and their patience. On behalf of all of the puppy walkers I would like to thank Graham Attwood for organising a great display and making all of the puppy walking teams feel welcome. Over the bank holiday weekend I was informed by Ernie’s puppy walkers that due to Family circumstances they would not be able to look after him anymore. 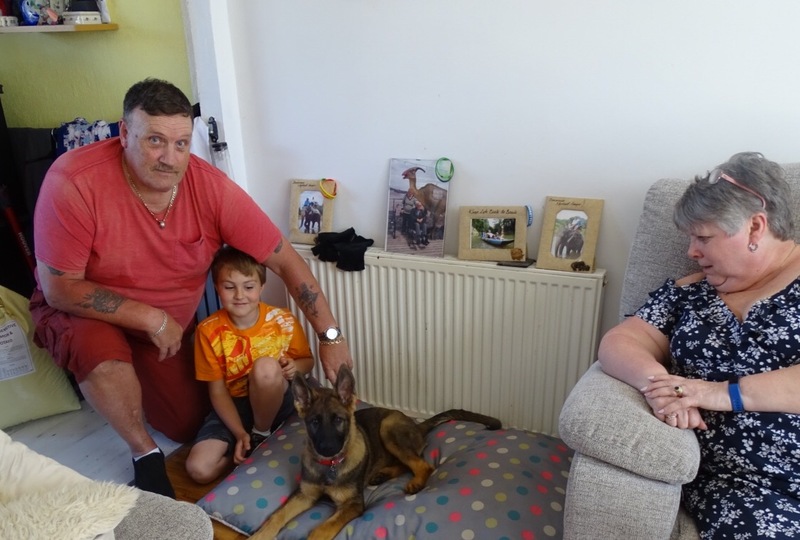 I have re-homed him with his 3rd set of puppy walkers Vivian and Dave in Exeter. Hopefully this will be 3rd time lucky. This week I will be continuing to look at Gunnar to see if there is a chance of him having the potential to be a Police dog and if not we have an excellent new home lined up for him. My next blog will concentrate on Gunnar and Star outlining the work I am doing with them. As its nothing to do with cute puppies I don’t expect too much interest but I have been asked by a number of our readers to do an update and so that is what I will do. From Ella, Gunnar,Star and me bye for now.